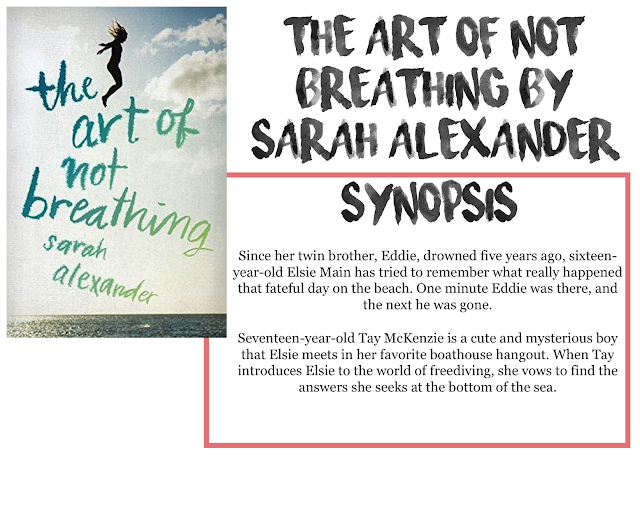 I am back with another book review, today it is The Art of Not Breathing by Sarah Alexander! Thanks to NetGalley for providing me with a copy of this book for review. All opinions are my own. I haven't quite decided what to rate this book yet, I think I'm going with 2/5 stars. I enjoyed it, but I just felt a little too detached from the story. I found the story itself was interesting, and the characters all seemed to be still reeling for the accident that happened 5 years ago, but I just couldn't connect with them emotionally. The main character, Elsie, is a little bit hard to love. She's feisty and headstrong, but she also is a little whiny and annoying at times. Her older brother Dillion was fine, he has his own issues that I don't want to get into for fear of spoiling anything, but up until pretty much the end of the story when we find out why he's having problems, he was not really, I felt, a part of the story. Actually, come to think of it, none of the other characters, other than Elsie, were really 'in' the story. Both of the parents were almost non-existant, because of the aftermath of the incident, which, I suppose is understandable, but I didn't like that. Tay and Danny were ok characters, but I feel like we could have done without the romance between Tay and Elsie, I didn't think it added to the story. And I felt like his reason for leaving wasn't very good. Danny was a jerk for no real reason, it wasn't Elsie's fault about what happened with his dad. I also got to the point where I thought I knew what was happening, but then I was thrown a curveball and I had no clue that was coming. Looking back, it makes sense, and I appreciate the false sense of predictability the author gave to throw me off the trail. Overall, this was a good book. Did I love it? No. Did I hate it? Definitely not. I read it in two sittings, so it definitely held my attention, it just isn't a book I'm personally going to go out and buy.